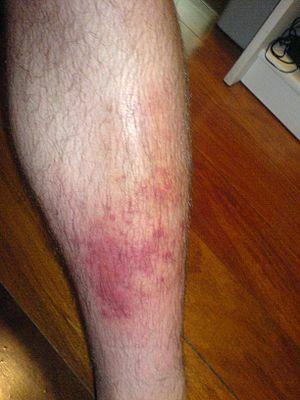 Bacterial skin infections in older adults, such as cellulitis, are common. However, for a number of reasons, bacterial skin infections in older adults can present differently to skin infections in younger people. For example, the skin feeling warm to the touch and looking red may not be present in bacterial skin infections in older adults. If bacterial skin infections are missed, they can spread and have potentially serious consequences. One such complication is sepsis (body-wide infection). Most of the research on the way that bacterial skin infections present in older adults has been performed in hospital–based studies. Together with a team of researchers at the Nuffield Department of Primary Care Health Sciences, Oxford, we decided to find out what research has been done in this area in the community setting so that the findings would be relevant to GPs. We searched the electronic literature for studies that assessed the ability of different symptoms and signs to predict bacterial skin infections in older adults. We included studies that were observational in design, conducted in the community, and that provided data to enable calculation of different diagnostic accuracy measures (such as how sensitive a particular symptom/sign is in predicting bacterial skin infections). Two studies of low-moderate quality were eligible for inclusion. One study was conducted in German nursing homes, and the other in American nursing homes and long-term care facilities. We found that the presence of wounds, pressure sores and skin ulcers were all predictors of bacterial skin infections. The absence of skin ulcers and wounds helped to rule out a bacterial skin infection. Being disoriented did not help to diagnose a bacterial skin infection. Being incontinent of urine was similarly not helpful in making the diagnosis in older adults. We identified only two studies that were suitable for inclusion, and as mentioned the quality was low-moderate. Few symptoms and signs were assessed by the studies, and we could not find any estimates for some of the symptoms and signs that we would like to have investigated (such as redness of the skin). All in all, from the evidence that we have at present, we cannot make any robust conclusions about the symptoms and signs that help to diagnose bacterial skin infections in older adults in the community. We desperately need more, high-quality studies assessing a wide range of symptoms in order to guide clinical practice in this area. Until this plea has been answered, GPs will need to rely heavily on their clinical judgement. Gbinigie OA, Ordóñez-Mena JM, Fanshawe T, Plüddemann A, Heneghan CJ. Limited evidence for diagnosing bacterial skin infections in older adults in primary care: systematic review. BMC geriatrics. 2019 Dec; 19(1):45. Many thanks to PPI contributors for their input.